Anyone know what would cause a case cover to bubble up like this? Happened to me last year. Washed my bike, then went for a ride. When I got home, I noticed it was bubbling up. I posted this also, it looks similar to mine. My pic is not that good, hard to see, but it is on the top. It bubbled some but has not peeled. It's been over a year now. Last edited by jackk; 04-08-2019 at 06:21 AM. I see 2 solutions- re-chrome or replace. 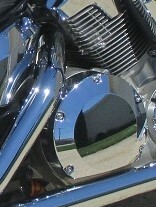 1300 Chrome on plastic. Possible reaction to chemicals and heat. OP>Washed my bike, then went for a ride. When I got home, I noticed it was bubbling up. Possibly steam if water was in cover and heat from lower pipe. Water dripping out onto heat shield or hot enough in cover..
Last edited by Hans&Feet; 04-08-2019 at 09:07 AM. Heat over time delaminates it. I had the issue after I put hard lowers on. Did you end up buying a replacement cover? Can you buy just that case cover, or do you have to purchase all 3 covers for the engine? I can't seem to find this same one I have anywhere. All I can find is the kury brand ones. I didn't replace it but I know you can buy a replacement. Check any of the oem sales sites and there are also aftermarket ones. rangers4u and Killer AB like this.